There she was, the perfect mom, dropping her kids off at the church nursery. I started comparing myself to her. Her hair was perfectly styled ….. That morning I had thrown my hair into a ponytail. She was thin and wearing a trendy outfit ….. The blouse I was wearing was carefully hiding the fact that my pants were still a little snug around my post par tum belly bulge. Even her purse was perfect, a Michael Kors bag ….. My purse? I got it from Target 4 years ago. I don’t just compare myself to people in real life. I even compare myself to moms on other blogs, and with Instagram and Facebook it is so easy to start making unrealistic expectations of myself. I start to feel like I don’t measure up when I read about other moms making elaborate suppers and running marathons. But here’s the truth about us all: We all have different strengths that make us unique, and and we all have weaknesses that we struggle with. None of us are perfect mothers. But even though we are not perfect mothers, we are THE perfect mother for our children. No one else can be my son’s mom like I can. He doesn’t want a perfect mom. He wants HIS mom. And that makes me perfect for him. Perfect in the sense of “just right” or “no one else will do”. Our children are gifts from God specifically chosen for us! When I give a gift, I want it to be the perfect (just right) gift for the recipient. If I, who make mistakes all the time, can give the right gifts to others, then God, who is the very definition of perfection, didn’t make a mistake when he made you and me moms. We are the just right, perfect moms for our children. Maybe today you feel like you fall short or can’t compete with the other seemingly perfect moms around you. Be confident in the fact that God chose YOU as the perfect mom for your kids. 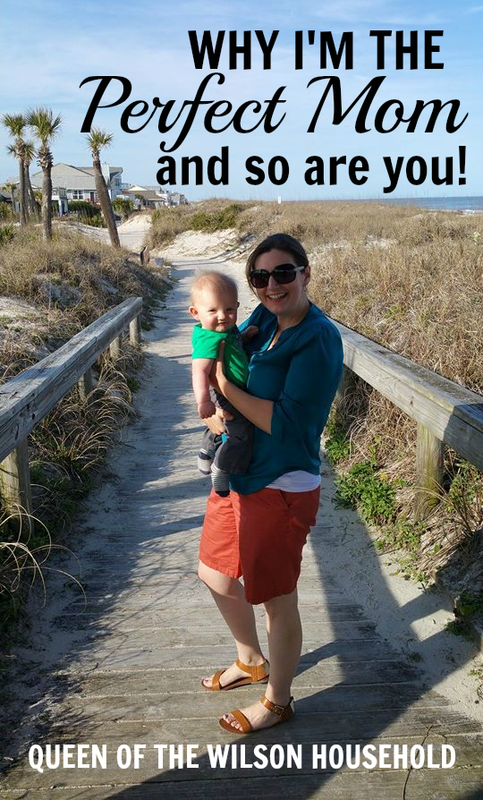 Tell me: Do you find yourself comparing yourself to other moms? Thanks, Liz! It was a great reminder to me, so I thought it would be a good to remind other moms too. I so needed this reminder this morning – with Daddy on travel for work and transitioning to a new preschool classroom, we had a rough start to our day. I'm not sure I handled it perfectly and have been dwelling on it a bit…this helps easy my mommy guilt a bit. Thank you. You're welcome, Steph! I'm so glad this was an encouragement to you. I love the promise of a new day when I have rough days. Hoping you have a better start tomorrow! I just told my dad this today!! I'm the perfect mom for my daughters, but I'm not the perfect mom! God has a plan – I believe our job is to thank him for the opportunities and blessings, and pray (in the good times and bad times). Yes, Jennifer! Thank you for the reminder to pray at all times, good and bad! Love this wonderful and powerful reminder. Thank you for sharing and for linking up! Thank you for visiting and for your kind words, Moriah.